You do have a compost pile, right? I have a little raised veggie bed right outside my back door- it is only 2×3 feet, but super convenient. Last summer, I would go out, pull up a green onion or two for a salad and go right back in. Next year, I plan to put in tomatoes, which are a heavy feeder- they like a lot of moisture, and a lot of nutrients. I put tomatoes in a different place every year, so disease organisms don’t build up. 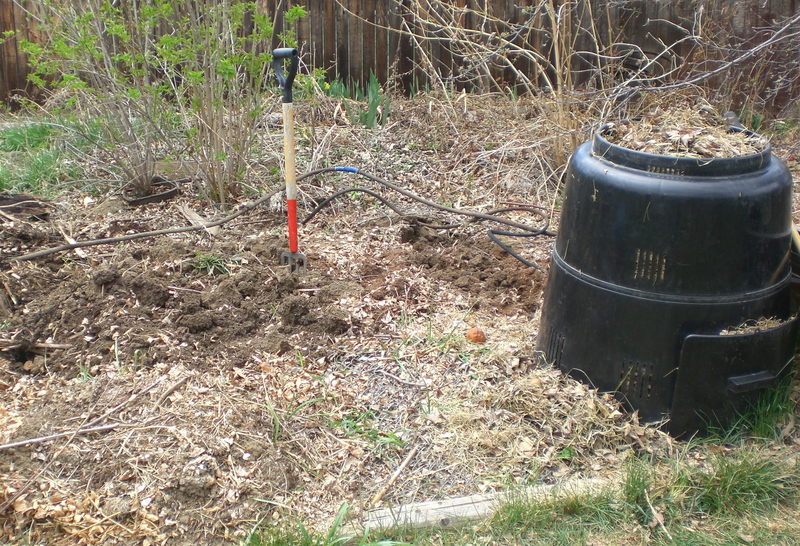 Solution- make this veggie bed the winter home of the compost bin, then spread it out in spring. I’ve written before about our bin(link to own post)- a Darth Vader head- very ugly, but pretty effective for boiling down organic waste into compost. I move it every few months, spread out the finished compost where it is, and put whatever is not broken down back in the bin in its new location. The partially broken-down stuff is seeded with the compost organisms that will help break down new material. Because I want the soil to be super rich, the first layer of stuff I put in the bin was comfrey leaves. Comfrey is an amazing plant- it has deep roots that take minerals out of the subsoil and concentrate them in the leaves. When the leaves break down, in compost or mulch, the minerals are deposited in the topsoil. The plants can be whacked back several times a summer and keep coming back on just natural rainfall. I add kitchen stuff as it fills up the cup on the edge of the sink, and layers of leaves, too. Kitchen waste is usually high in nitrogen, and can be smelly if there isn’t high carbon material added at the same time. Compost breaks down all winter, although it is slower when the weather is colder. In about March, I’ll lift the bin off and hopscotch it to another location. I’ll take off what hasn’t broken down, and spread out the finished compost- moving some to other beds that need it, but saving a lot for the bed. My tomatoes will have a deep bed of good soil to feed on. You don’t need a Darth Vader head, or any kind of container- compost will break down anywhere. I like my bin, but I recognize it isn’t necessary.